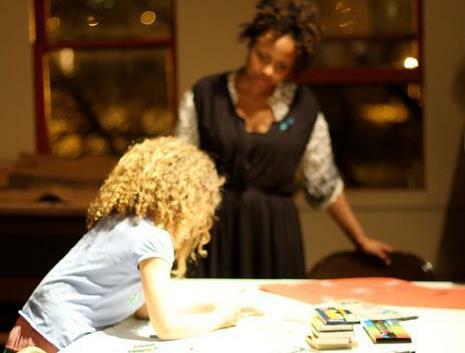 Leah Gipson is an interdisciplinary artist and an Assistant Professor in the Art Therapy Department at the School of the Art Institute of Chicago (SAIC). Gipson's art practice uses the specificity of culture to develop ideas for social transformation. This practice is informed by her professional experiences of working with survivors of sexual violence, adults living with addiction, women who have been incarcerated, women experiencing homelessness, and individuals living in psychiatric and residential homes. Her understanding of art therapy comes from Black feminism and Black Church, which emphasize community leadership, and women, and girls. She has been working on projects in west side neighborhoods of Chicago since 2009 to address problems of inequality and launched a series of collaborative participatory projects in 2013, which focused on funding for local artists. Gipson's most recent projects include The Rectory and the Austin Neighborhood Studio Co-op for which she received the Propeller Fund Award (2016); Care Sessions through the SAIC Office of Engagement at Homan Square (2016-2018); and DIVISIVE (2016 - present), a live radio talk show Gipson created with Craig Harshaw and Keith Brown on WLPN-LP Chicago 105.5FM Lumpen Radio. She is a board member for A Long Walk Home, an organization that “uses arts to empower young people and end violence against women and girls." Her publications include: “Challenging Neoliberalism and Multicultural Love in Art Therapy” and “Is Cultural Competence Enough? Deepening Social Justice Pedagogy in Art Therapy” in Art Therapy: Journal of the American Art Therapy Association, and a chapter “Envisioning Black Women’s Consciousness in Art Therapy.” in Talwar (Ed.). (2018). Art Therapy for Social Justice: Radical Intersections.